Super clean copy, great dynamic range, smooth warm pressing. Be aware, my copy was a 1968 sealed copy, complete with original price stickers from the day, and it came with no inner sleeve. I'd have no fear or hesitation in purchasing this particular pressing again. 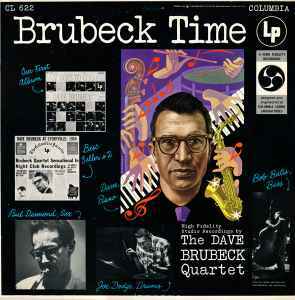 Dave Brubeck must certainly have been infatuated with ‘time’, as this is one of five albums with ‘time’ in the title, and the first in that series. Recorded in the fall of 1955 when Brubeck and his players were laying thing down their music live for the most part, this diamond was recorded in the studio, featuring Joe Dodge on drums, Bob Bates doing a brilliant job on bass, and of course Paul Desmond on alto sax. Brubeck Time should command much more attention that it’s received, as it’s one of Dave’s more laidback albums, filled with a sense of coolness and evenhanded depth. There are only two original numbers on the record, “Audrey” and “Stompin’ For Mili”, though the editions of the remaining standards will have you stretching your head, feeling that they’re originals as well. Overall, in an artistic sense, this record does not come off as expansive, though by no means should it be considered as background music, as it’s been recorded with precision and focus, meaning that you’re in for a dynamic treat of focused attention demanding listening, where these artists weave in and out of each other’s playing without stepping on a single toe, where the players both encourage and define each other, rolling on perhaps not relentlessly, but with a the swagger of self assuredness and the personification of all things you’d expect from a true jazz outing that didn’t require insane jumping and useless meanderings … it just is what it is, an intoxicatingly wonderful session, captured and designed so well that it’s come to define what a jazz session should be. The sound is clean and warm, due entirely to the mono format, and if I may be so bold, perhaps the only way to hear this collection. This is early 50’s jazz at its very best, its finest, holding up as well today as it did nearly seventy years ago, as Brubeck like too few others has a near magic about his music, with his ability at catching people’s ears and enchanting them into his world of smoothness, a world that existed somewhere between swing and be-bop, as suitable for breezy daytime as well as late night infatuation. *** The Fun Facts: The album art was designed around the painting Boris Artzybasheff did for the Time magazine cover in November of 1954. As to the number “Stompin For Mili”: Mili was Gjon Mili, a photographer who agreed to film Brubeck and his sidekicks recording the session. Mili could be a rather short dismissive person, and in so doing with his attitude toward the song sincerely got under Brubeck’s skin, where in a rage of frustration, Brubeck laid down a sonically invincible second-take, which is what you’re hearing on this recording. The song “Audrey” was indeed penned for Audrey Hepburn. Sadly, though depending on your point of view, Columbia recorded this album in mono, then re-channeled it for stereo. The album was also re-released under the title of Interchanges 54’ with four additional tracks lifted from the album Jazz: Red Hot and Blue. Any comments as to the reason for such occurrences/similarities/differences will be appreciated.